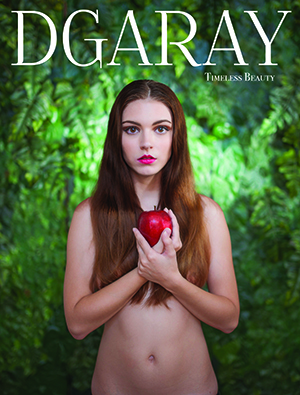 To be honest, photographing and reviewing this show was so personal and a great honor. I fell in love with Glass Animal’s first album shorty after it had came out in 2014. 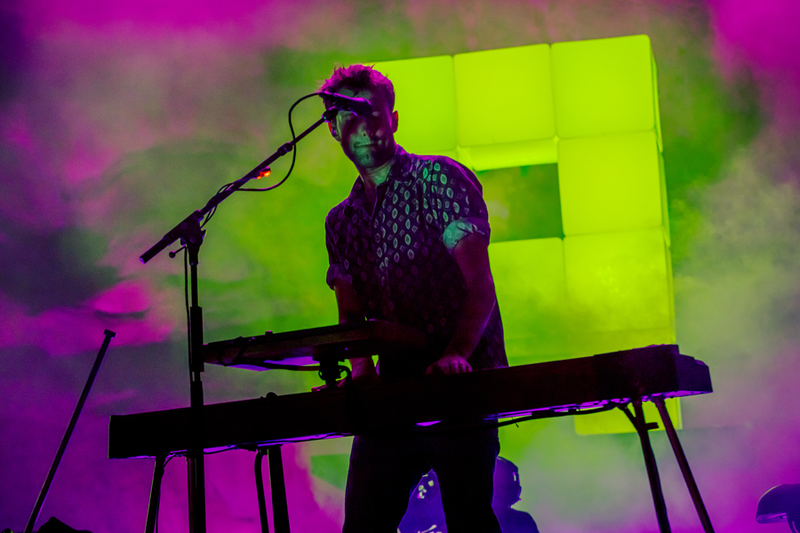 Their music invoked certain emotions that reminded me of my first memories of bands such as Radiohead, Smashing Pumpkins, and even Alt-J. When I heard their album ZABA it had such an honest yet sexual vibe to it, that couldn’t help but make you dance. 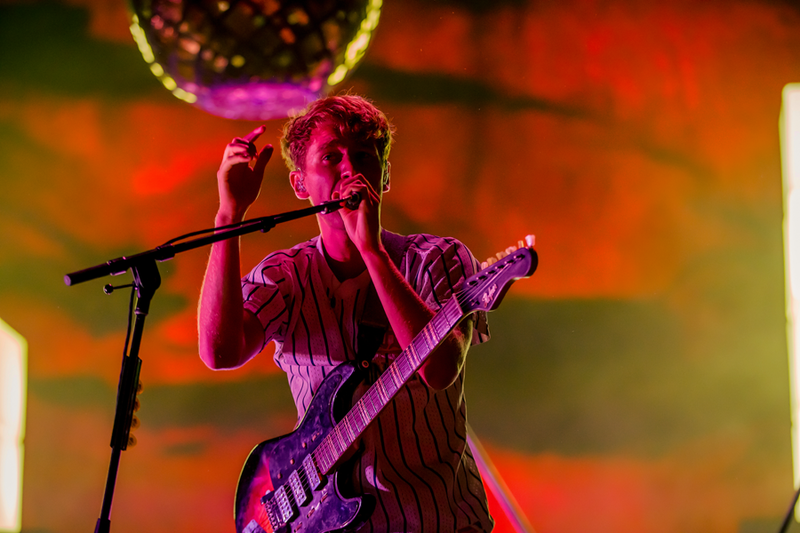 It began hard to not bring up Glass Animals when I was out talking music with friends. At the time it was hard for me to describe their sound because it was something I had never heard before. I always ended up with the same description, “No other bands sound, has ever turned me on more”. 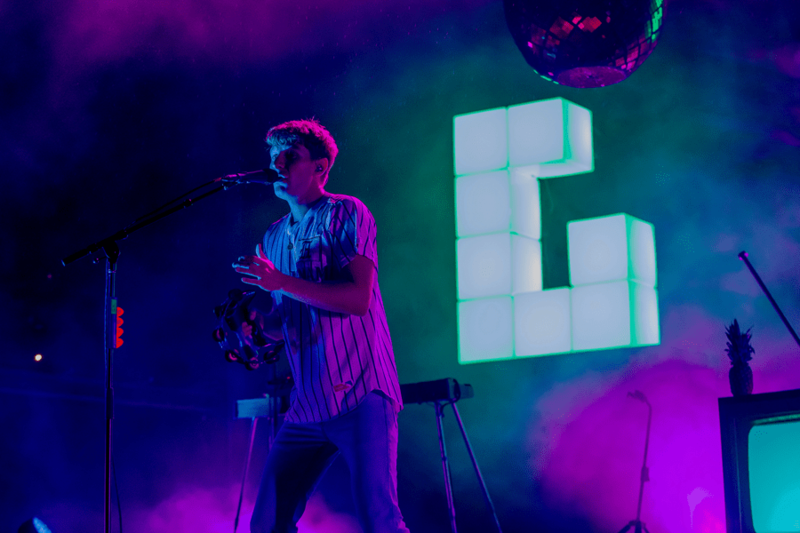 Glass Animals opening up for Portugal. 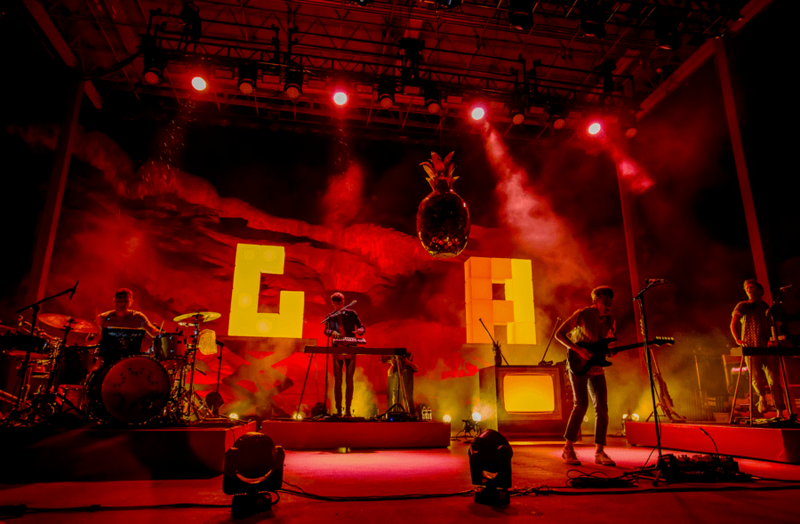 The Man at Red Rocks Ampthitheatre in 2016 was my first show I got to see them perform. That show at the time was the best Red Rocks show I’d ever been to, out of hundreds under my belt. 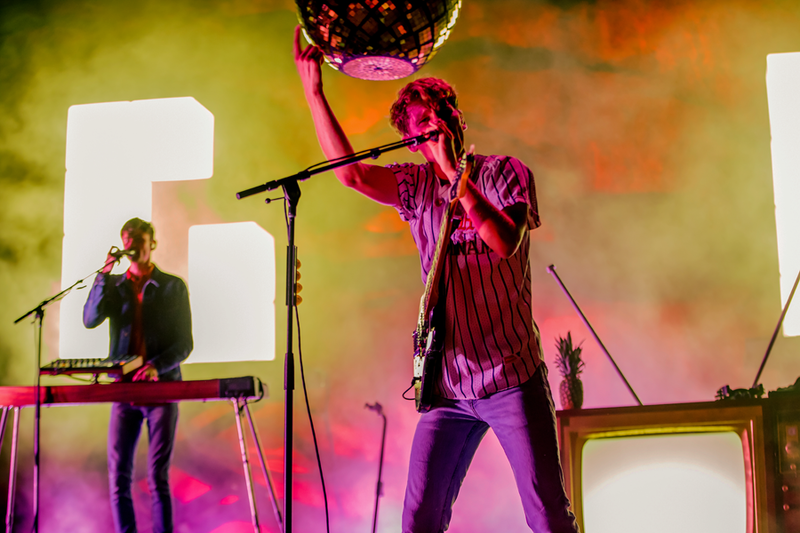 David Bayley, lead singer from the Glass Animals had yelled out – “Someone once told me that if you ever get to play at Red Rocks, you know you’ve made it, well I guess we’ve made me!” and the crowd went wild. That immediately held so much weight. A few days after the show I looked up to see where they were heading to next on their tour. I was then able to catch them at The Greek Theater in Los Angeles, CA a couple months later. 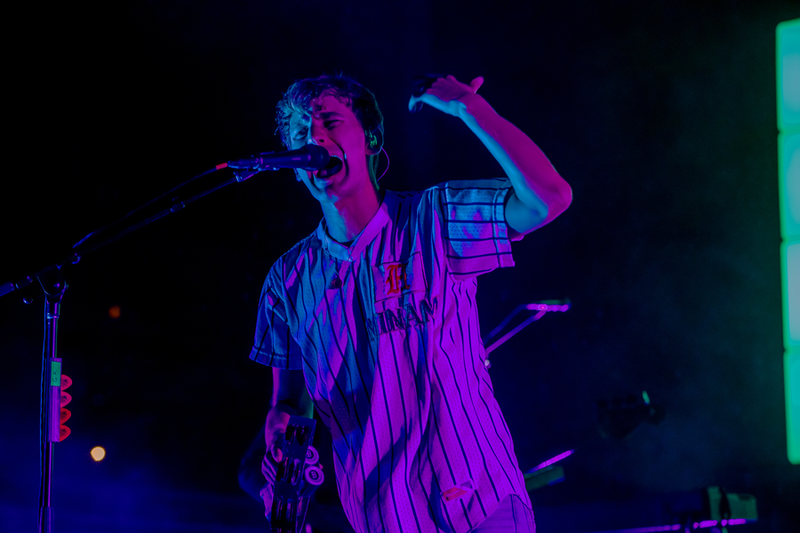 This show was one of the first venues on that tour they had started to play their second album How To Be A Human Being, that had just recently been released. I became emotional moved by their second album after that show on so many levels. 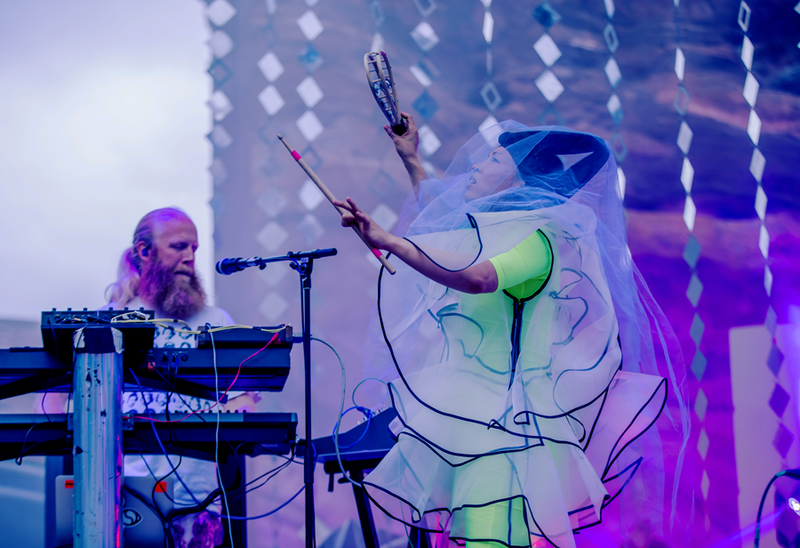 I was so excited to hear about them coming back to Red Rocks with Little Dragon opening up for them to play a sold out show. 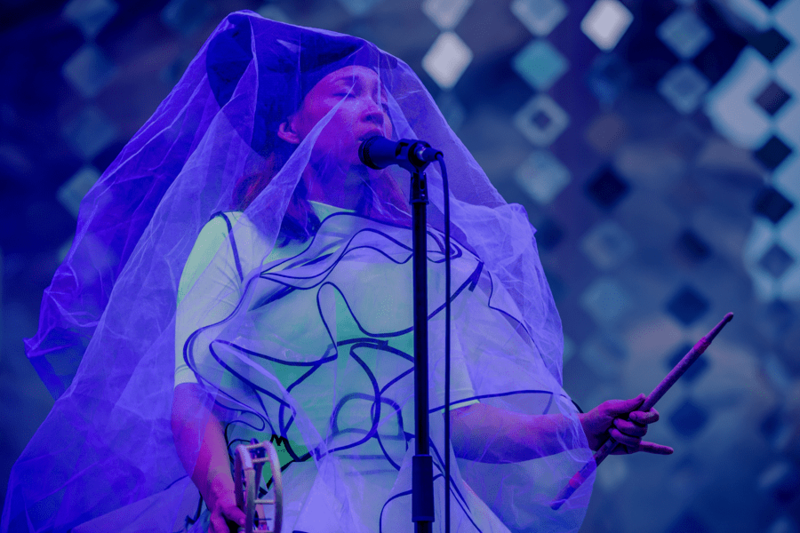 For Little Dragon fans they got the highlight of the good weather for the evening with a vivid and bright performance. 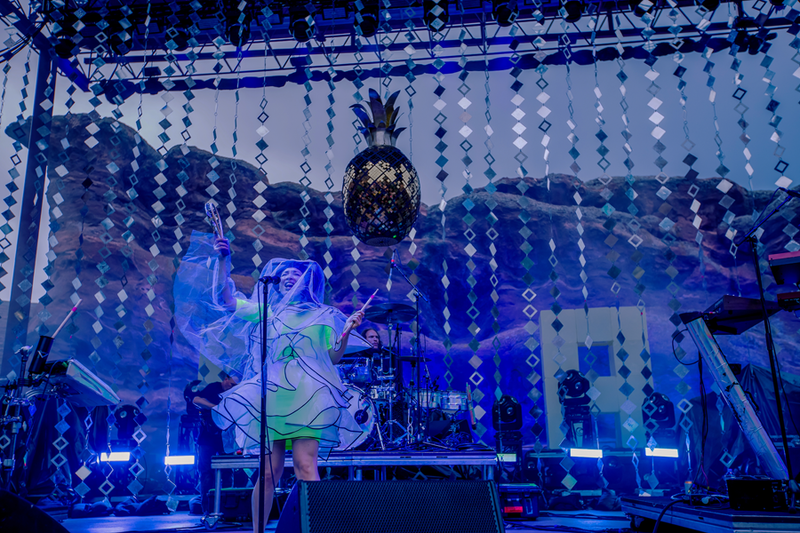 The Swedish band walked out ready to rock and roll with several sliver diamond shaped garlands hanging down from the top of the stage creating an even more majestic background against the infamous red rocks. 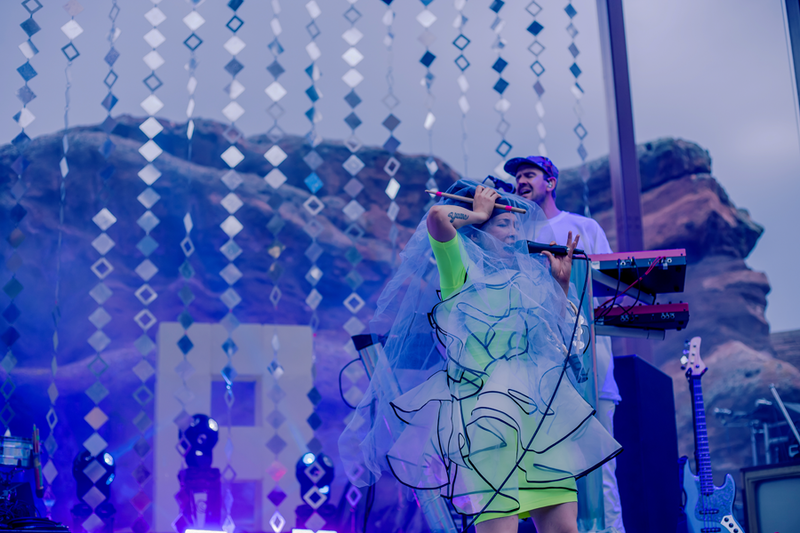 Singer Yukimi Nagano, came out wearing a profound neon dress with a purple veil draped over her body. 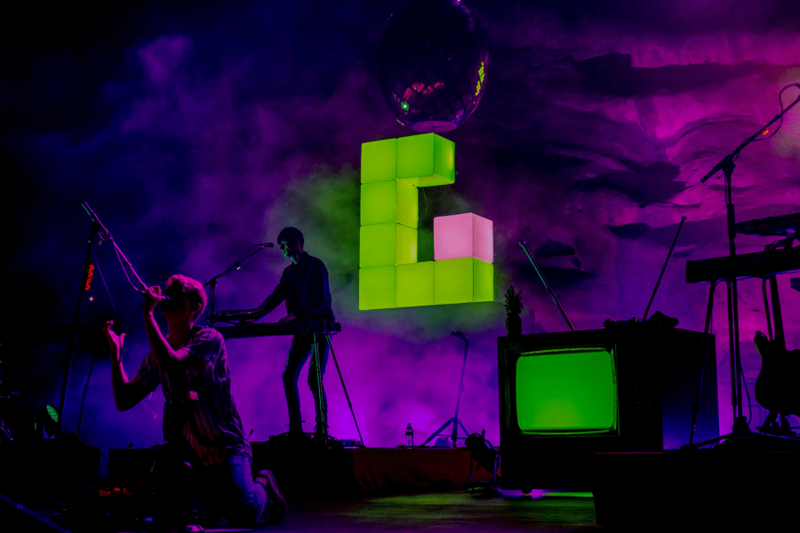 The band played some of their biggest hits – “Ritual Union,” “Feather” and “Klapp Klapp”. Nagano’s hypnotic dancing with an orange cow bell and tambourine went to a whole other haunting level after leaving the stage to change into a neon red veil. 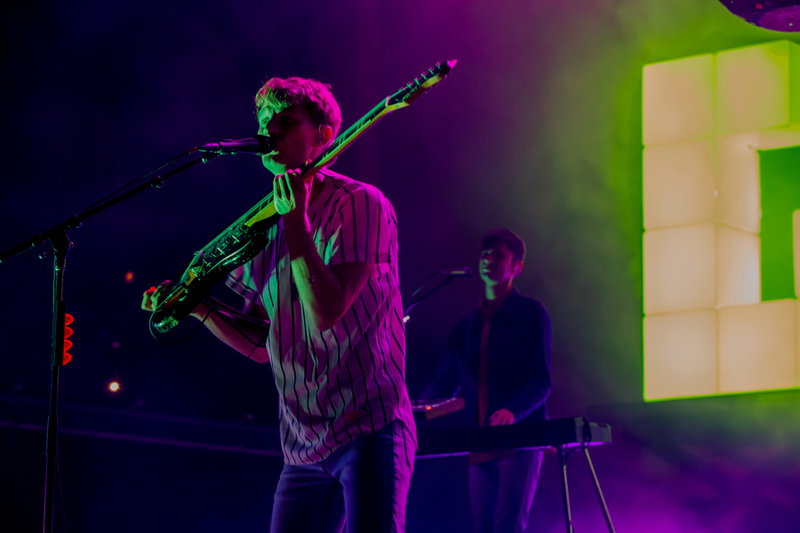 Glass Animals were only able to play five songs before having to take a 30 min break because of a thunder and lighting weather warning. It ended up being an intense down pour, but they returned back onto the stage with just as much energy as when they first come on. They’re entire set list had a great variety from albums ZABA and How To Be A Human, such as – “Black Mambo,” “Hazey,” “Toes,” “Gooey,” “Season 2 Episode 3,” “Anges,” and of course “Pork Soda.” On the topic of “Pork Soda” I ran into people passing out blow up pineapples which warmed my heart. I held onto mine untill throwing it out into the crowd when they closed out the show with the iconic song. Being in the crowd around so many other fans that knew every single word to every song like I did, took me to a concert high that I realized I live for.“The Other Side of Paradise,” and “Pork Soda” moved me so intensely because to me, they are tragic love songs, that made me feel okay with how upset and heart broken I was from a past break up. 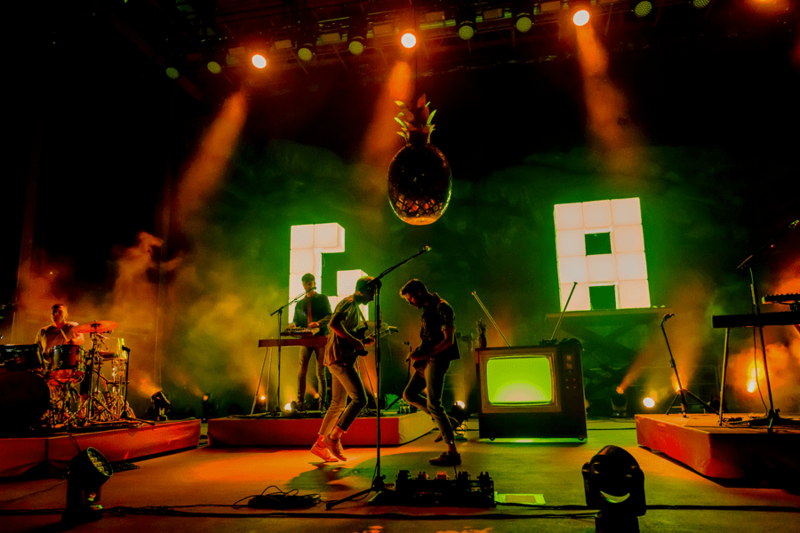 What I also realized I got to experience from this show with 10,000 fans singing along with me to some of my favorite songs is that Glass Animals are amazing story tellers! The best art is created by the best kind of storytelling, the kind of storytelling that all people from all over can relate to on their own personal level.